Dr Clyde Hughes shares with you what he has learnt over more than 30 years working as a healer, medium, dowser, space clearer and exorcist. Clyde runs an animal healing sanctuary and all proceeds from this book will go to help run his sanctuary. I have had amazing things happen to me over the years; some good; some bad, which I’ll share with you in this book. 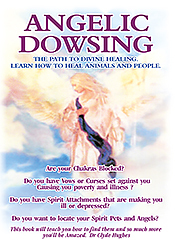 This book teaches you how to perform healing on people and animals, how to dowse from start to finish and how to locate by dowsing your Spirit Animals, Guides and Angels. This book includes a powerful chakra clearing meditation and a clearing protection prayer from Arch Angel Uriel. Clyde shares with you case studies of miraculous healings. I use divining rods and the pendulum to actually locate energy blocks in the body and to locate blocked chakras. This book teaches you to find any negative energy /spirits that have attached to you which can bring ill health and exhaustion. Are you feeling depressed and drained of energy and cannot shut your mind off ? Find out what could be causing it with this book.